I find cauliflowers quite easy to grow, but certainly not everyone sees them that way. They do take up quite a lot of room in the garden, so I tend to only grow them through the cooler months, when space is abundant and there a few things to grow. I often get complimented with my winter cauliflowers, I get asked what my secret is. Well it’s simple and it has worked for me over the past couple of years. I get my winter brassica in the middle April, there is still enough warmth for them to get some good growth behind them before the winter chill sets in, and the threat of the white cabbage moth has just about disappeared or become controllable. I find the Purple Sicily Cauliflower is incredibly disease resistant. The only problem is that the colour does not hold and often ends up in the cooking water. They do need full sun and moderate watering. Although I find in winter the rains are sufficient to allow it to grow. They love to be mulched. I use my standard mulch cover of whatever I have available which is usually fallen leaves and spent chook hay. I set them out approximately 50 centimeters apart to allow for adequate space between plants to spread their leaves. Every now and then (when I can be bother or when I have it available) I water them with some worm tea. Harvest your cauliflower when the head is still firm. 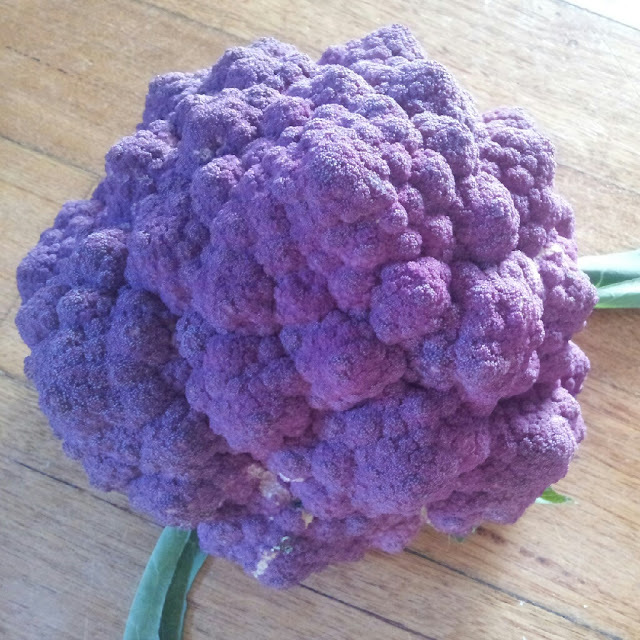 My favourite way to eat cauliflower at the moment is to make a cauliflower puree, although I am yet to do this with the purple cauliflower as I believe the colour would be an interesting one and may not be pleasing to the eye (I am thinking greyish sludge). What is your favourite way to eat cauliflower? Oh yum sounds delicious, I have never tried it with garlic, but will add it next time I make it! Thanks for stopping by! I am a big fan of cauliflower sautéed with ginger and spices - really really good! I'm wondering sautéing or roasting (ie no water) would help it retain its purple colour. Yum that sounds amazing! I will give it a go and see if it improves the colour situation. I did try cauliflower fritters in an attempt to retain the purple colour, but they just went golden brown instead. Thanks heaps for your suggestion, I will definitely give it a go!